Excellent blog. I just started experimenting and am quickly on my way. I didn't realize bottlers were so cheap. I've been saving GT bottles, but now have second thoughts after seeing that crusty rusty cap. Also, do you prefer original kt or do you have a favorite recipe? Thanks! I’m glad that you are starting to brew! Yes- it is too bad about the GT bottles! Everyone seems to have them on hand, but the rust is unappealing. i love the beer bottling!!! i added a few cinnamon basil leaves to my last brew and it turned out pretty delicious! oooo cinnamon basil sounds great! thanks for the tip! *Please Note* that Katalyst Kombucha has begun bottling in reusable bottles, and that GT's bottles now have plastic caps! (Although the plastic caps still do tend to leak on me...). But yay for more sustainable options! Hi! I'm about to bottle my bucha and am wondering if the only way to add fruits or other stuffs is by putting a little bit in each bottle before filling or if there's a way to do it all at once. Also, how finely do you chop the ginger/ how much do you add? I'm slightly worried about ginger's antimicrobial properties, but I loves me some ginger so if that's not an issue I wanna add as much as possible. Oh, also, aren't SCOBY's partially bacteria so that filling it all the way might kill the bucha? Thanks! 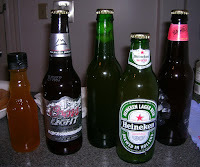 -I add around 2 tsp of "stuff" per 12 oz beer bottle, although I never measure. I cut the ginger pretty small- the more surface area the pieces have, the better! -You can add flavors to a larger amount of kombucha in a secondary fermentation for a few days (such as in a quart container, covered with a breathable cloth). However, if you want more fizz, you may still want to do the bottling process afterwards. Also, you will want to remove your kombucha mushroom at this point to not harm it. Or if you have an extra kombucha mushroom that you want to experiment with, you can leave a mushroom in there. If the container you’re using has a narrow neck, you can fill the kombucha to the top. If not, cover the container with a breathable cloth. -That is a good question about filling the kombucha to the top and killing the bacteria! I have been trying to do more research on it. The yeasts are facultative anaerobic, so they can survive. I used to think that filling the kombucha to the top would cause the bacteria (which need oxygen) to go dormant, and the bacteria/yeasts do go dormant when they’re put in the fridge, but if the kombucha is still fermenting at room temperature for a few days, it is possible that the bacteria will not be able to survive without a good oxygen source. However, I also believe that there is some dissolved oxygen in the kombucha, so that may help some of the bacteria for a little while…Although I am not exactly sure what happens to the bacteria during the secondary fermentation of the bottling step/how long the bacteria can survive w/o a good oxygen source, much of kombucha’s health benefits come from the beneficial acids produced by the bacteria, such as acetic acid, gluconic acid, and lactic acid. -If I learn anything else I’ll post it, or if you have any more questions please ask! This is probably a bit late, but you might want to correct an error in the pressure section. Like you said pressure=force/area. However, having a greater area(wider mouth) would decrease the pressure and not increase since you are dividing the force by it. If you think about it area of the metal cap you are using stays the same under the assumption that the bottle is a rigid body. This leaves the force as variable in the equation or in more simpler terms in the yeast is creating co2 which in turn increases the force. I've heard people use balloon as caps instead which theoretically would be better at preventing explosions since the "cap" would now be elastic rather than rigid. Thanks for noticing that, Jeanette! It's been awhile since I originally wrote this post, and I definitely have learned a lot since then. I will update this post and thanks again! I thought that I'd share my own bottling experience here in the San Francisco Bay Area (Northern California). First off, I agree with you that glass bottles are the best, as you recommend on top. AAMOF, I find that Trader Joes (a semi-specialized food outlet here on the West Coast) sells 33.8 fl oz bottles of brewed tea, that when empty are PERFECT for bottling kombucha for secondary fermentation! After finishing the tea, I wash each bottle and its small aluminum cap with warm tapwater and dishsoap. I then rinse with cool filtered water to eliminate any soap or other residue, then I allow the inside of the bottle and the cap to dry before adding the kombucha tea that's finished the primary. When filling each bottle, I fill to approximately 1 inch below the bottom of the cap, and then I very TIGHTLY cap the bottle for pressurized secondary fermentation/carbonation. Another suggestion you presented on top was to use [old] plastic bottles. I reviewed Dr. Andrew Weil's caveat at http://www.drweil.com/drw/u/id/QAA188289 , and I see very little to worry about here with simple attention to some basics. Yes, standard 24 fl oz and 2 liter plastic soda bottles are made of PETE #1 (=polyethelene terephthalate) which "could" conceivably release significant levels of DEHA under the right conditions. OTOH, if someone has already _recently_ purchased such a PETE soda bottle, then it makes perfectly good sense to re-use such a soda bottle ONLY ONCE OR TWICE for bottling kombucha -- and CERTAINLY NOT FOR MONTHS!! -- before disposing of such a bottle. IMNSHO, the Pros to using such bottles outweigh the Cons here, and I would rate PETE bottles for bottling kombucha a very close second after using glass bottles. The three key areas to ensure carrying out here are 1) to wash out each PETE bottle and its cap with warm tapwater and dishsoap after each prior beverage within each bottle has been consumed, 2) to rinse each PETE bottle and its cap with cool filtered water following the above washing to eliminate any soap or other residue, and 3) to use each PETE bottle ONLY(!!) once or twice for kombucha bottling. I'd like to follow through on my OWN long comments above concerning YOUR 'Kombucha Bottling 101' post. This essentially corroborates what I wrote above, but with better explanation. Again, let me reiterate to the point of redundancy..... polycarbonate bottles should NEVER be used for bottling kombucha!! 3. As far as using PETE #1 plastic for bottling kombucha, I would ALSO add my strong suggestion that such bottles store kombucha for a fairly short time. In your DIRECTIONS' Step 4 above, you recommend that bottling be carried out for approximately 4-5 days. IMO, I suggest that PETE #1 plastic bottles will be safe and effective for bottling and storing kombucha for these 4-5 days +PLUS+ an additional week or so. As the two-week bottling-time of storing kombucha approaches (and passes), one absolutely MUST consume the fully-finished kombucha tea ASAP!!! I believe that this suggestion will result in reducing the possibility of bottles' swelling, leaking/cracking, or chemical-leaching as will [eventually] occur if the finished kombucha is stored in such bottles for much too long a time. thanks @itfactor36 for visiting my blog, and for such thorough commentary on the bottling process! your comments regarding bottling in plastic are very helpful! hi! once it's bottled & flavored and in the fridge, how long can it last in the fridge?? we are on our third batch, our first 2 batches were no good, but finally got a very healthy scoby and the kombucha is wonderful and fizzy! just wondered if our first batch from a few weeks ago would still be good, it's been in fridge... ? Glad you came across my blog! Kombucha can last for up to a year in the fridge. The better you are with sanitation, the better chance that the kombucha will last longer in the fridge. Yes, your first batch from a few weeks ago should still be good if it's been in the fridge. Like soda though, kombucha loses it's fizz once opened. If I put a large jar with kombucha in it in the fridge, I usually put a SCOBY in there with it to keep it slightly active. Awesome, thanks for this info. It has been very helpful. I cant wait to bottle my fermenting KT and add fruit& herbs. I am fairly new to brewing Kombuca. I have a question. In my early brewing I had a batch that fermented a little longer than to our tastes. I saved some and stuck it in the fridge. Now that I have babies, I am looking to start a second container. Can I use the tea as a starter for my new batch? I failed to save enough on this last batch. I think that tea should be fine as starter tea (unless you notice that the tea has some strange or off-putting odors or appearances that are not typical of kombucha). If you still have some kombucha from your last batch, I would add that in, too. You could also brew a smaller batch for this round, if you are concerned you still may not have enough starter tea. thank you for all this information kombucha master Ho!